Like kitchens, a good workshop requires plenty of cabinet and counter space. 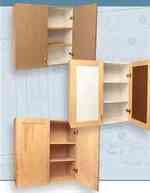 Our shop cabinets will help you keep your tools safe, out of harms way. The plans are designed to give you a wide range of choices in terms of materials, countertops and configurations. No matter what sheet material you use (MDF, MCP or plywood for example) the step-by-step techniques remain the same. Rugged, adaptable design fits a variety of worksho needs. Simple frameless construction for easy customization. Pick materials that work best for your budget and still look great in your shop. Kitten Step Stairs with Hideaway Storage Woodworking Plan. This storage shed plan can be downloaded after purchase. This full featured plan contains all diagrams and instructions, pitches and angles, stud layout and rafter details. Contains both inches and metric measurements.